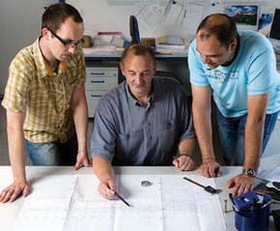 Design and development has an outstanding importance with the esw GROUP. Our own development department ensures that we achieve market maturity for new products in cooperation with our customers. At the same time, cooperation with the universities and technical schools is important to us in order to further take a front row part in the developments. We work with the most modern 3D-CAD systems and are able to process all usual data models. We simulate complicated forming processes with a special software which allows us to explore additional optimization potentials.